Although Chiang Mai is the second-largest city in Thailand, with a population of around 1.5 million people, you won’t see high-rises dominating the skyline. Instead, the ruins of ancient moat walls and crumbling Buddhist stupas continue to thrive, keeping Thai history alive against a backdrop of modern development. I love the deep artistic spirit of the city; walls and fences of buildings and streets are splashed with the vibrant murals of talented local painters. At the Saturday and Sunday night markets you can get lost in the treasures of local craftsmen selling everything from homemade clothes to ceramics, paintings and trinkets. Most importantly, the cost of living is incredibly affordable and convenient. 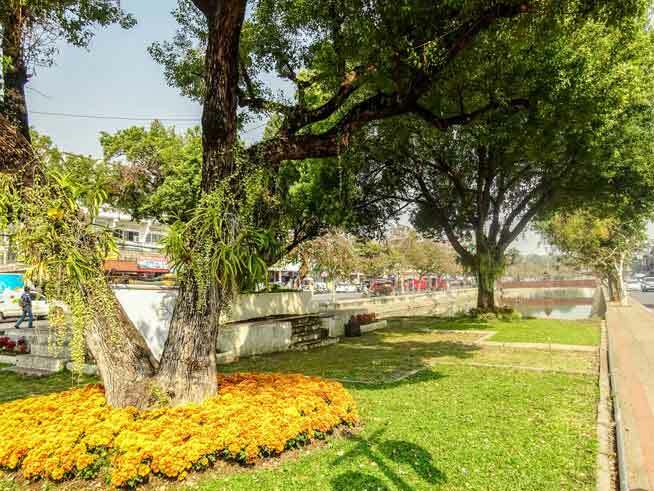 I live just off Nimmanhaemin Road, a pleasant area of town with a flourishing expat scene. Though Nimmanhaemin has a reputation for being pricey, there are plenty of affordable living options. You can find modern, fully-furnished studio apartments with a swimming pool, cleaning service, and air conditioning for around $400 a month. If you’re looking for something quieter, navigate the romantic side streets, where charming townhouses, guesthouses and apartments abound. My boyfriend and I share a spacious studio apartment with air conditioning for around $200 a month, and that includes utilities and internet. The dining scene around Nimmanhaemin is divine, offering melt-in-your-mouth, traditional Thai dishes at simple eateries for a little over a $2 a plate, as well as plenty of Western fare if you get homesick. There are plenty of trendy bars and clubs to kick back in the evenings with a cold beer for around $3 to $4 each. My favourite meal is the tofu and vegetable red curry at J-Yai Thai restaurant, just down the street from my apartment. When I need some comfort food, Musashi offers a tasty collection of specialty sushi rolls at a fraction of the cost of what I would pay back home. The salmon sashimi melts like a slab of butter on the tongue and the taste is just as rich. For me, living in Chiang Mai is all about the diversity and easygoing vibes. It’s not at all fast-paced and overwhelming like the capital Bangkok, yet it’s never boring. Cruising alongside tranquil moats and centuries-old walls on my motorbike is one unique characteristic that distinguishes Chiang Mai from any other place in Thailand, the Land of Smiles, and why I fell in love with the city to begin with.